If it wasn’t for the foresight and generosity of Peter Eastman, and his son, John Eastman, Turkey Hill Farm would not be the treasure that it is for so many people today. The 200 year old farmhouse on the Cape Elizabeth property is surrounded by eight acres of field and fifteen acres of woods. At eighty-five years of age, Peter Eastman is still going strong. 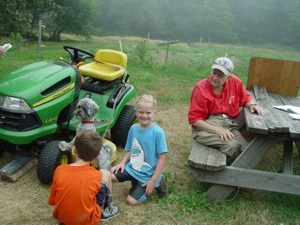 He heads to the farm almost every day and still enjoys dabbling with various chores and visiting with guests. Depression, Peter’s grandfather was forced to close the store. The side of the barn at Turkey Hill Farm had blown off during a storm in 1929. With the arrival of some lean times, Mrs. Eastman changed her plans of renovating the barn into a living room. The dirt floor in the barn was replaced with a wooden one and plans were carried out to transform the barn into a tea room and gift shop. Pictures of the old tea room can be viewed on another webpage of the website. Peter Eastman was an only child. He enjoyed coming to the farm and sometimes invited friends. After he graduated from the Holderness School in Plymouth, New Hampshire, he enlisted in the Navy. V-J Day took place while he was in boot camp. 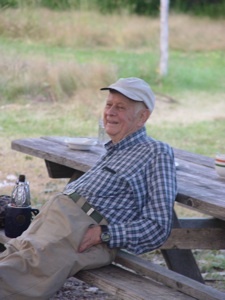 He then headed to Bowdoin College and graduated in 1951. The Korean War came along and he was commissioned in the Officer Candidate School in January of 1952. A stint of teaching science followed at the River School in Chestnut Hill, Massachusetts. 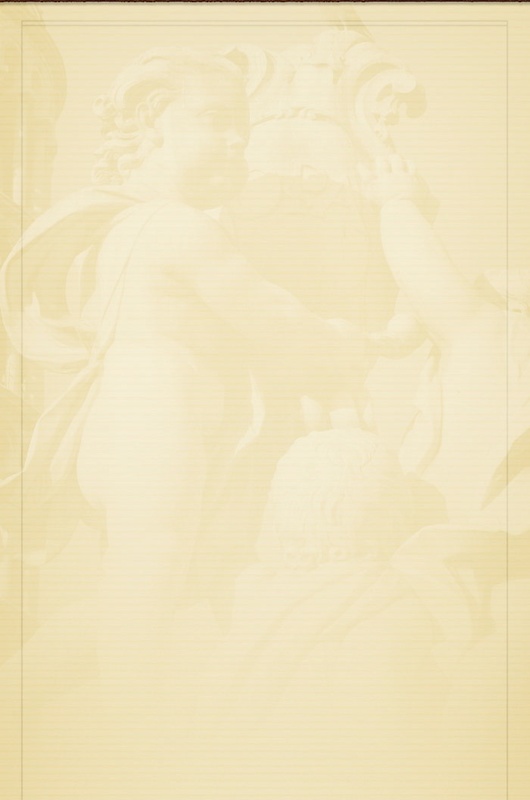 For several years he was employed as a technical writer at Raytheon in Burlington, Massachusetts. More years were devoted to technical writing at Honeywell Data Processing in Wellseley Lower Falls. 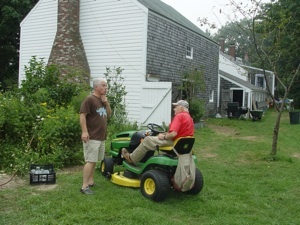 Peter and his son, John, moved to Maine in 1968. For twenty years Peter taught physics at the Southern Maine Vocational Technical Institute in South Portland. open spaces and farmland. 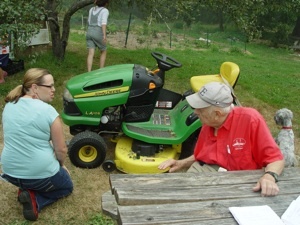 His son, John, suggested that they participate in the FarmLink program and John Bliss and Stacey Brenner were invited to farm their land. 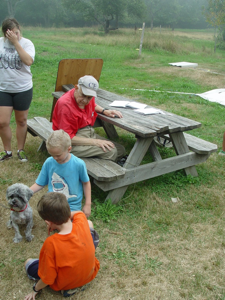 Peter and John also welcomed the Farm Camp to the property when John and Stacey were farming. 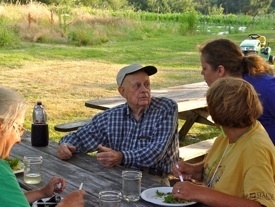 Through connections with the Farm Camp, a non-profit organization in Portland called Cutlivating Community, subsequently hooked up with Turkey Hill Farm. Peter may jokingly try to disassociate himself from all the green thumbs and gardeners at Turkey Hill Farm, but it is quite obvious that, in reality, he is a true environmentalist. 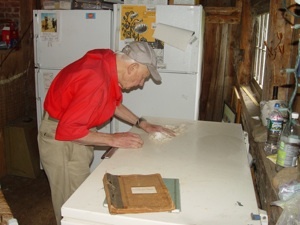 He and his son, John, generously granted a conservation easement to guarantee protection of the land so that people can enjoy, farm, and learn from the Turkey Hill Farm property in perpetuity. 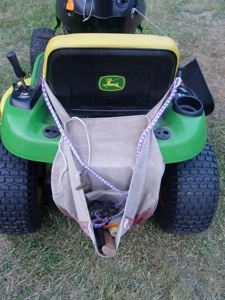 Peter carries his tools in a canvas bag strapped to his John Deere tractor. Peter enjoyed a meal with some teachers from the Maine Agriculture in the Classroom course. 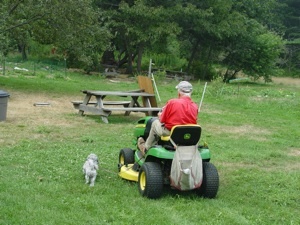 Homer, a friend’s dog, often accompanies Peter to the farm. 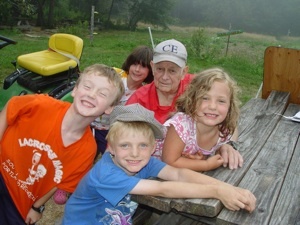 Peter Eastman is surrounded by some of his friends from Farm Camp.